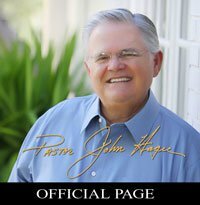 From Pastor John Hagee... visit the Cornerstone Church site here. If you haven't already heard, you will soon hear on the national media about the radical protesters that invaded Cornerstone Church Sunday protesting the right of Israel to exist. I want my friends and partners to have "all the truth and nothing but the truth." Sunday morning, May 15, 2011, at Cornerstone Church in San Antonio a day was set aside to express our appreciation for the State of Israel and the Jewish people. Hundreds of churches across America and around the world joined us as we stood in solidarity with Israel in this time of crisis. What I didn't know was that eleven anti-Israel protesters came to our 11:00 am worship service pretending to be worshippers. They sat in different sections of the church; some in the balcony and the majority on the main floor. As it turned out, none of them were Palestinians; they were all local radical activists. As I stood to deliver the sermon, one female "Palestinian protester" stood at the edge of the balcony and began throwing anti-Israel propaganda leaflets on to the main floor of the sanctuary. She was not screaming; she was throwing leaflets by the handful on the heads of the people below. The propaganda leaflets said, "We stand in solidarity with Palestinians and demand an end to U.S. support for Israeli occupation, apartheid, and violations of the human rights of Palestinians. We stand in solidarity with the Third Intifada demanding the right of return to occupied territories." One side of the propaganda leaflet has the picture of a mother burying her child under the caption "Your tithes are responsible for this!" The leaflet claimed Israel was responsible for the deaths of 1,500 children since the year 2000. Cornerstone Church has an outstanding security team consisting of highly trained and professional police officers. On this particular Sunday they were simply spectacular. They quickly located and escorted out the leaflet protester. Five minutes later, a second protester stood and started screaming as loudly as she could, "Free Palestine! Israel is apartheid. Israel has no right to the land." She was quickly escorted out by security as the congregation cheered and applauded their action and her exodus. Five minutes after that, a third protester stood and started screaming fanatical propaganda phrases against Israel that are used all over the world to attack Israel and the Jewish people. I now knew we had a major and highly organized protest on our hands whose objective was to shut the service down to prevent this nationally televised tribute to Israel. At this point, I told my congregation, "The objective of these protesters is to shut down this tribute to Israel. I'm going to finish this sermon if it takes until 6:00 pm tonight." The congregation cheered like it was the Super Bowl. These protesters did more to unite our congregation in one hour than a dozen preachers have done in the past few years. Protester after protester every five minutes stood, screamed slogans, and was escorted out by security. We finished our service in one accord and with total joy. The protesters were taken to the chapel where they were photographed, required to give their identifications, and charged with criminal trespass by our officers. If they return to church property they will be sent to jail. Some were sent to jail immediately because of outstanding warrants for their arrest. One-third of the staff of a local non-profit organization, the Esperanza Peace and Justice Center, participated in this anti-Israel church invasion. In reviewing the Esperanza Peace and Justice Center Facebook page it appears that at least five more of the eleven protesters participated in past protests publicized by Esperanza. Esperanza Peace and Justice Center receives tax funding from the city of San Antonio and the state of Texas. 1) Israel is not a political issue…Israel is a Bible issue. Truth is not what you think it is, truth is not what I say it is, truth is what the Bible says it is. The reality is that Israel is the only nation created by a sovereign act of God in the Book of Genesis. Israel was not born on May 15, 1948...it was born 3,500 years ago when Almighty God made an eternal covenant between Abraham, Isaac, and Jacob and their descendants (see Genesis 13:14-15 and Genesis 17:7-8). 2) Those who believe the Bible are commanded in Psalms 122:6 to "Pray for the peace of Jerusalem; may they prosper who love you. Peace be within your walls, prosperity within your palaces." 3) God has promised in Genesis 12:1-4 to bless every person and nation who blesses Israel and to curse every person and nation that curses Israel. The effectiveness of this divine mandate is seen in the lives of two Pharaohs. The Pharaoh that blessed Joseph and the Jewish people avoided starvation and knew unlimited prosperity; the Pharaoh that "knew not Joseph" and who drowned Jewish male children in the Nile River was himself turned to fish food in the Red Sea with his army. Exactly what you do to the Jewish people, God will do to you. 4) In Luke 7 the blessing of healing came to the house of a Roman centurion (a Gentile) with a sick servant. Why? Jesus Christ, a Jewish Rabbi, entered the Roman centurion's house and prayed for his sick servant because "he built a synagogue" in the Land of Israel (see Luke 7:1-5). 5) St. Paul has commanded all Christians in Romans 15:27, "For if the Gentiles have benefitted from their spiritual things (the Jewish people) it is the duty of the Gentiles to minister to them in material things." What spiritual blessings have the Jewish people given to us? They have given us the Word of God, the Patriarchs, the Prophets, the first family of Christianity (Mary, Joseph, Jesus, and the 12 Disciples) and the Apostle Paul. Take away the Jewish contribution to Christianity and there would be no Christianity. 6) We support Israel because Jesus Christ our Lord said, "I say to you, 'Inasmuch as you did it to one of the least of these My brethren, you did it to Me.'" (Matthew 25:40). The phrase "My brethren" refers to the Jewish people. Jesus never called the Gentiles His brethren until the cross. Before the cross we were, as St. Paul stated, "outside the covenants of Israel, without God and without hope and of all men most miserable." 7) We support Israel because Obadiah 1:15 and Joel 3:2 make it very clear that any nation (including America) that tries to divide the Land of Israel (including Jerusalem) will indeed experience the judgment of God. Simply stated, the day America turns its back on Israel will be the day God will turn His back on America. 8) We support Israel because Israel has the right to exist! We call on the President and Congress to demand that Hamas and the Palestinians recognize Israel's right to exist or to cut off all foreign aid immediately. Israel has the right to defined and defensible borders. Israel has the right to defend itself from any nation or group of people that attack them. To all Bible believers, let us UNITE to stand up and speak up for the State of Israel. God is watching! Well said Pastor Hagee! I also call on every Bible believers to unite and to stand up and speak up for the State of Israel. Also for all Bible believers to contact Mayor Julian Castro of San Antonio and Governor Rick Perry of Texas and demand an apology from Esperanza Peace and Justice Center and demand that our tax dollars STOP FUNDING their organization. IT'S TIME TO SPEAK UP NOT TO SHUT UP. Agree 100%!! This should have been news on the mainstream.